Today I'm wearing my first dress from Maje, a French brand that describes its overall aesthetic as "feminine, understated, glamorous and bold." Is that me? Maybe. But -- regardless -- I fell in love with this dress and had to have it! The dress has long sleeves, a hugely flared skirt and a compelling print. It makes me feel so good when I wear it! I don't go to special events where I need to dress up, so I dress up for work. It's become a part of who I am. I'm perpetually overdressed but always in style. 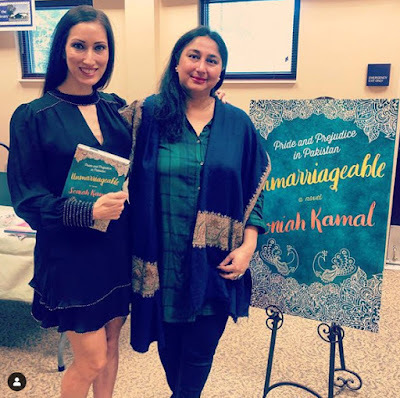 I met the author Soniah Kamal on Saturday morning, and the rest of the weekend was very relaxing. Chapin and I continue to be obsessed with The Great British Bake-Off (#GBBO) and have started the new season of True Detective as well! 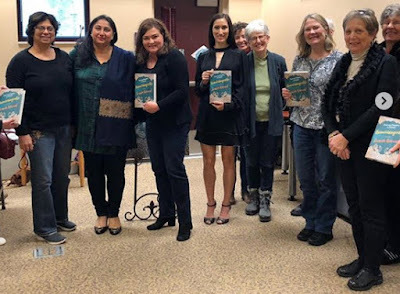 Here are a few photos from the author meet and greet. I look exhausted because I had to get up really early to get a workout in before going out to Johns Creek!